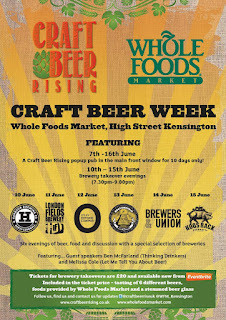 Craft Beer Rising are taking over an area of Whole Foods Market in Kensington High Street in June for a series of beer events with special brewer evenings (from 10th - 15th), and a pop-up pub. Sounds great! 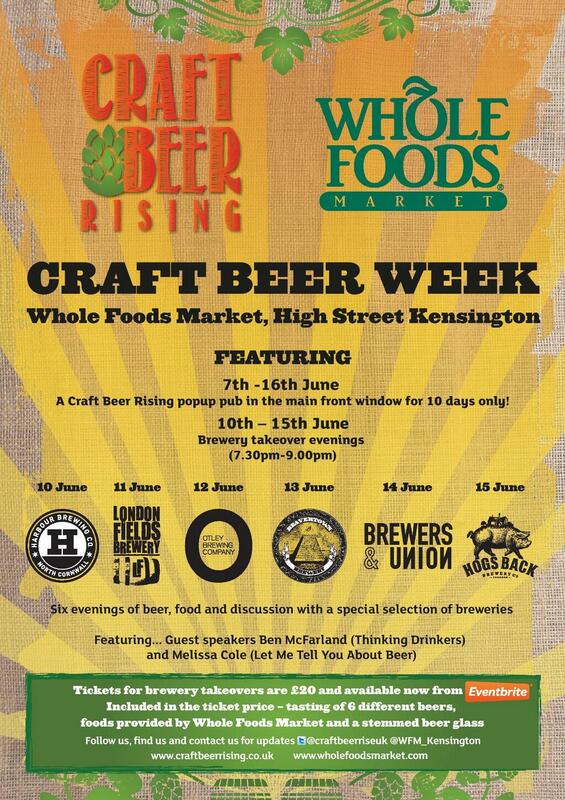 "We're partnering with Whole Foods Market and staging a special 10 day celebration of craft beer at their flagship store on High St Ken between 7th and 16th June. Firstly we'll be transforming their main front display window into an amazing popup pub (seating 30 people) serving a variety of cask/keg beers. This will be open throughout the festival and punters will be able to enjoy a beer in the window whilst the world goes by on High St. Ken - a unique experience we think! During w/c 10-15th June, our popup pub will be used to host a series of beer and food tasting evenings staged by six different breweries and featuring guest speakers, Ben McFarland and Melissa Cole."